You don't want to miss this grand opening event, you won't find one like this anywhere else. 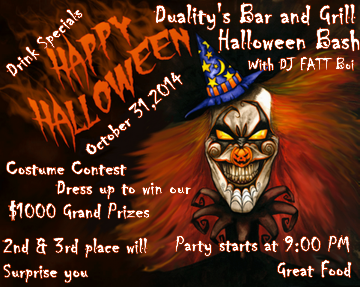 La Porte, IN.Our grand opening and biggest Halloween Bash around. We do have a $5.00 cover charge for this event. Great food, awesome drinks and one heck of a great time. We have a live DJ all night. Grand prize of a huge $1,000.00 for best costume of the night so come with your costume and be ready for a chance to win a $1,000.00 cash prize for first place. There is a surprise 2nd and 3rd prize as well for the best costumes.